I was recently at a regional conference for librarians (CASDA), participating in a panel discussion. The subject of covers came up and there seemed to be quite a lot of interest. Some in the audience seemed genuinely surprised at how little control we, the authors, had. Of course, control varies according to the status of the author, the style of the publisher, the deadline, and the book. But for the most part, writers don’t have final word. Or much say at all. And I think that’s fair, since the publisher is the one who is out there trying to sell the book. Sure, we can make a fuss about things, but there’s a risk to that — nobody likes a “difficult” author. Hey, let’s face it, book-making is a collaborative process. I think you have to let people do their jobs. And when the sales force says, “We can’t sell a book with that cover,” well, I’m not going to throw my body into the gears of that machine. Because I want the book to sell, too (sue me), and I’m not the expert. Now, is this new cover an improvement? I don’t know, but it certainly communicates different things than the original. To begin, I thought the first cover was brilliant graphically: a bold, arresting visual presentation that suggested the school environment. It looked cool, almost like a poster. But at the same time, sort of vague; you don’t come away knowing much about the story. Yet the vagueness was appealing; it was evocative. Or so I thought at the time. Besides, after you read the book — if you read the book — you’ll then “get” the cover. It will all make sense. The second cover — now forever known as the real cover — established a totally different look by using photography. That’s always a difficult medium, especially for writers, because the nature of photography provides a specific, concrete image. It defines. It limits. We now know exactly what Spider Stevens looks like, whereas before it was open to our personal interpretation, up to our imaginations. What this cover does do, however, is it quickly lets us in on the story. A glance tells us that it’s about two boys. One has green hair and seems to be staring at a brick wall; he might be an odd duck. 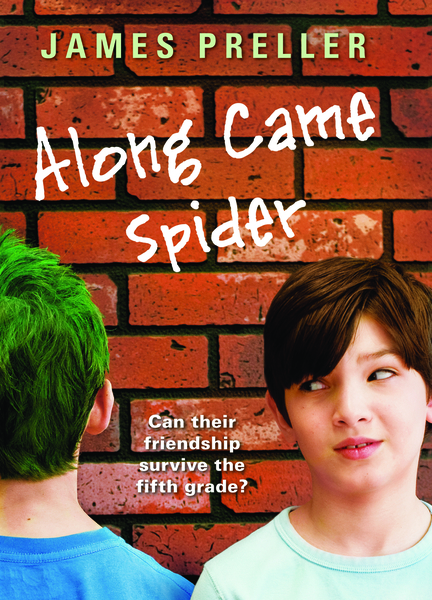 Then there’s the tagline: “Can their friendship survive the fifth grade?” All in all, the new cover effectively conveys the central strand of the book. But it also limits because the book certainly isn’t about only that. There’s Miss Lobel, the librarian. And the fabulous Ava Bright. And basketball. And . . . pencils! I don’t really have the answers. There are no firm rules about what makes a good cover. Or what, precisely, a cover should do (other than, I guess, encourage you to open the book). What do you think? So far, no one has used the “comments” section to this blog. Here’s your big chance! One of the central ideas for this blog is that I hope to communicate about what’s going on right now. The life of a writer, I guess — not that my life is so exciting or brillliant, but, um, it’s all I’ve got. So over time I’ll talk about getting started on books, the challenges of revision, fan mail, reading book reviews, having ideas rejected, whatever is happening personally and professionally at the moment. Maybe even talk about coaching Little League or the deep joy of driving my green John Deere (it’s a farmer thing). We’ll see how it goes. A few months ago, I received an email from a woman named Tammy Ellis-Robinson. She explained that she was the editor of Skribblers Magazine. Tammy invited me, as a local author, to speak at their annual celebration, scheduled for May 15th. Tammy explained that Skribblers was a non-profit magazine dedicated to publishing children’s writing and artwork from the Capital Region in New York. She sent me a copy; I was instantly impressed — they publish in e-zine and print formats — and, of course, I told Tammy that I would be happy to help. So a few nights ago, after wolfing down my oldest son’s birthday cake (15 candles! ), I made the short drive to the event. I was greeted warmly by several volunteers and led into the auditorium. There were about 200 people in attendance, children and their parents — eager writers and artists and the people who love them. Tammy took the stage and won my heart. Because Tammy Ellis-Robinson was clearly a force of nature: dynamic, silly, dedicated, energetic, fun-loving, smart. Next, Anne Marie Doyle introduced me to the crowd and I gave my talk. The event wasn’t about me, and I kept it short. Said some things, read some things, got out of the way for the night’s real entertainment. For then a number of proud children came up, one by one, to read their pieces. I was stunned by the quality of the writing, the simple joy of being in that room, witness to all that blossoming talent and great energy. And I couldn’t help but feel at that moment that I had the best job in the world, that I was blessed to be invited into this scene, to be a small part of something so good, where the creativity of our children was nurtured and celebrated, and to meet remarkable people like Tammy Ellis-Robinson. It was a rewarding, uplifting experience for everyone fortunate enough to be there. So check out the Skribblers website. It includes games, writing tips, and lots of poems, stories, and drawings. If you are from the area, sign up for a subscription — or encourage a child to submit a work. If not, you might want to use Skribblers as a model for a magazine in your own community. And if you are a teacher from the area, you may want to contact Tammy to see about getting Skribblers distributed at your school. Because I’m telling you, it rocks. Congratulations, Tammy. Congratulations, kids. And a big round of applause to all you adults who were in the room that night, it couldn’t happen without your love and support! 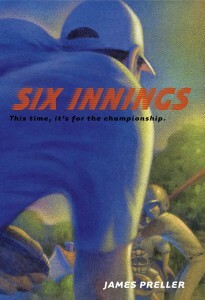 This is the cover of my newest book, Six Innings. But basically, I’m just messing around with adding images. The art was done by a guy named Chris Sheban, who also did covers for Because of Winn-Dixie, The Tiger Rising (both by the fabulous Kate DiCamillo), and the “Charlie Bone” books. I think Chris did an amazing job — what a cool perspective, what great colors — and all I can do is thank my lucky stars. To read some reviews for Six Innings, click here (and scroll down), or here, or way over here (more labor-intensive scrolling!) and, why not? — here! This is the first post in my Blog New World. I’m just trying to figure out how this thing . . . goes!